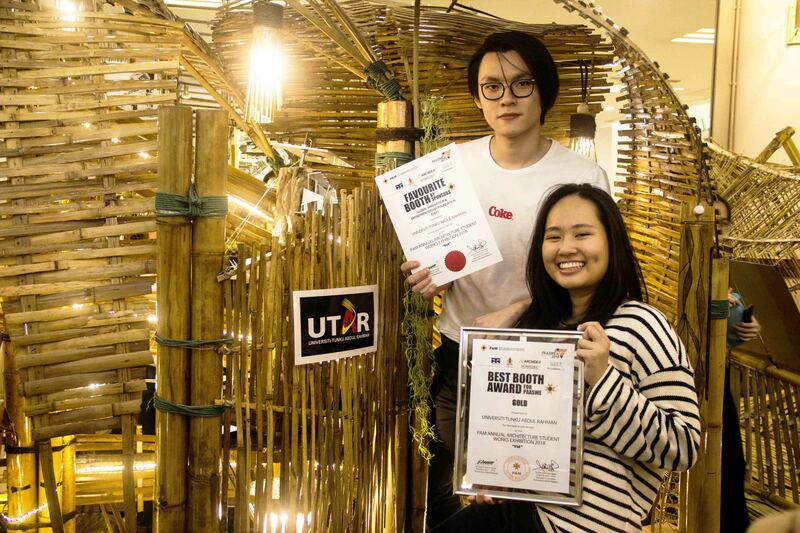 UTAR Architecture students garnered two awards, namely gold for the “Best Booth Award” and “Favourite Booth” by Sponsor (GIEF) at the 13th Malaysian Institute of Architects (PAM) Annual Architecture Student Works Exhibition 2018 (PAASWE18) for their deconstructivist tunnel design, Decon(life). 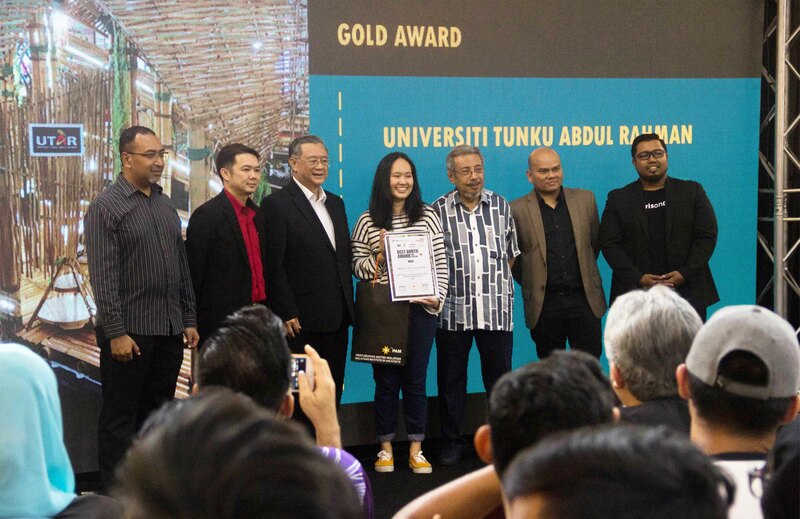 The exhibition was held from 17 October 2018 to 21 October 2018 at 1Utama Shopping Centre, Petaling Jaya. Themed ‘VIA’, the exhibition saw the participation of 23 local public and private tertiary institutions this year. 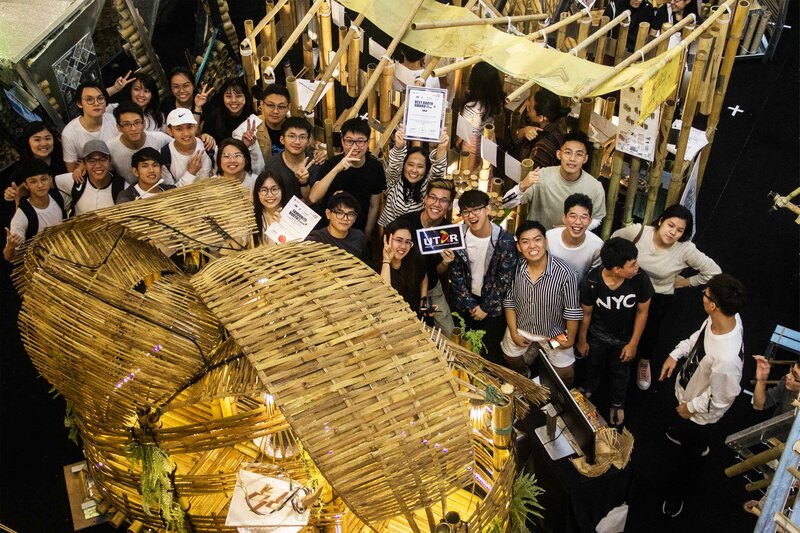 According to the guidelines prescribed by PAM, each participating institution was to design a tunnel that showcases the participating students’ architectural works. 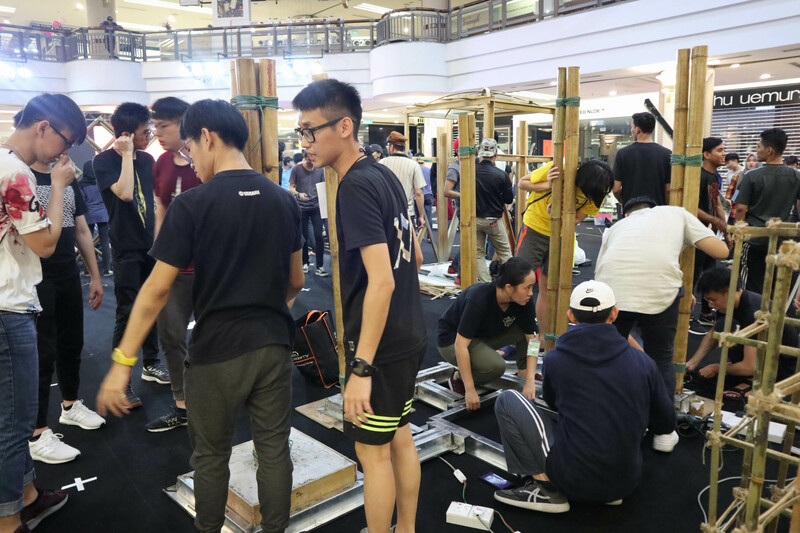 The students were also required to use materials such as bamboo, Z purlin, PVC gutter and metal decks, which were sponsored by Global Innovation & Entrepreneurship Foundation (GIEF) and Thung Hing Group. The structure was supported by self-standing columns and floor joists in order to withstand the weight and the tension stretching from the woven bamboo roof and the woven bamboo façade. Unlike a typical tunnel, the students designed a curvilinear pathway instead of the conventional rectilinear pathway. “Part of the objective was to block the visitors’ view of the exit from the entrance. 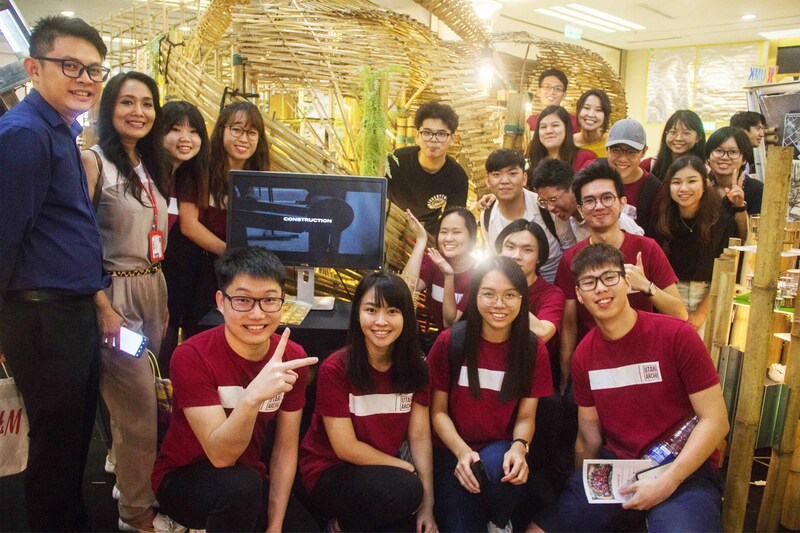 The exit is at the entrance however the anticipating journey throughout the tunnel is led in a dramatic manner, unseen from the beginning,” said team leader of the first year architecture students, Wong Jia Wen. The 44 committed students involved in the UTAR team for the competition were Adrian Woo Jia Tseng, Ang Zhao Cong, Austin Lee Yoong Yee, Candy Chan Teng Min, Chai Wan Jin, Chai Zhi Zhong, Cheng Yee Shuang, Chong Cia Shen, Chong Jun Hao, Chong Wai Xuan, Chor Zhao Gen, Chow Yuet Mei, Chrislyn Lau Chin Xi, Daniel Chia Jun Xin, Ho Guo Liang, Joey Tay Ruo Yi, Kevin Sia Pik Hao, Khoo Ke Xuan, Kim Zhe Ro, Lau Chi Ying, Lee Ni, Lee Ze Bin, Lim Chen Hee, Lim Jie Min, Lim Jie Ying, Lim Jun Yu, Lim Song Liang, Lim Weyn, Loo Junn Hao, Low Yoong Sheng, Ong Shr Yii, Ooi Yong Jian, Ow Kar Yong, Rebecca Hiu, Sam Kai Xiang, Sin Kah Yee, Tan Hui Lun, Tan Karl Shawn, Tan Tai Yon, Tan Wei Jia, Tan Yu Qin, Tia Nam Keng, Chang Jing Mei, and Wong Jia Wen. 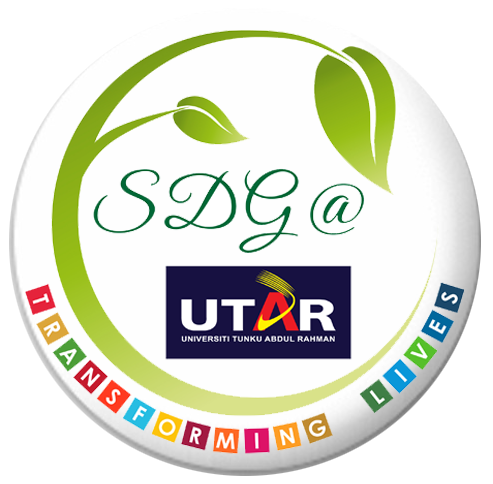 “Thank you UTAR for providing us with this opportunity to participate in this competition. We would like to especially thank our advisors for guiding us, Mr Wong Yee Choong and Ms Rahmawaty. As for the members who worked hard, thank you for your sacrifice and for working during the trimester break to make this happen. Our gratitude also goes to other universities that came to visit and give support and advice for our project,” said vice team leader Chong Cia Shen. For more information about the project and design click here.